Japan Farmers Markets: Bok Choi in the House! In the hoophouse, that is. 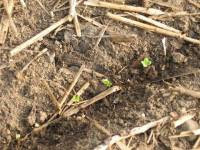 I suspected two days ago that I saw little sprouts, but yesterday I spied a sweet little row of those first leaves - the cotyledon - that begin the process of photosynthesis. (Hope you don't have to squint too much to see them in the photo!) The unseasonably warm weather the past few days, I am sure, was quite helpful in getting things going. Things are meant to become a bit more wintry now, so we'll see how the remaining seeds do.